Feb. 14, 2011, 11 a.m.
By Joshua Benton @jbenton Feb. 14, 2011, 11 a.m. Above, you’ll find all my slides tied to an audio recording of my talk — just click play to get it started. If you’d rather read a transcript with links, that’s below. And if you’d rather watch the video, look at photos, or download it as a podcast, all those links are here, including the Q&A that followed. My thanks to the CJF (a.k.a. le FJC) for inviting me. It is great to be back in Canada — both as someone who has visited here a number of times and also as someone who is a Cajun from south Louisiana, which means I was booted out of Canada in 1755, when some English-speaking folks didn’t like some French-speaking folks. But in the end, we ended up getting crawfish and warm weather, so I feel like in south Louisiana, we managed okay. As Nora said, I run the Nieman Journalism Lab at Harvard. When asked what we do, I tend to describe us as 85 percent newsroom, 15 percent thinktank. We are trying to bring in some of the benefits of being so close to so many smart people in the academic world. But we also spend a lot of time reporting on what’s going on, what are the trends happening at new startups online, at traditional news organisations that are tryng to adapt in a variety of ways, what can we learn from other online endeavors that are not directly related to journalism but may have lessons to share with journalism. And one way that we try to do that is, last month, we asked a number of web and journalism luminaries to contribute their ideas, their predictions for what journalism would bring in 2011. We had reactions from Clay Shirky, Steven Brill, Dave Winer, Vivian Schiller, the head of National Public Radio, Markos Moulitsas from Daily Kos, Kevin Kelly, the cofounder of Wired, and a variety of other people. I hope you go check them all out on our site, niemanlab.org. But my charge tonight is really to try and narrow things down a little bit, from all the things that we could be talking about in the future of journalism. And I thought a good way to that, to try and provide a focus for my remarks — although I’m very happy to wander as widely as we would like in the Q&A — is to focus on eight things — eight trends. Because I know people at presentations enjoy lists, and they enjoy writing them down in order. You can do that or not. But eight things that I’m in particular watching for in 2011, that I think will play a role in how journalism evolves. So let’s get started! So, raise your hands if you at home have a Tivo or some other DVR. [Lots of hands.] All right. So for those of you who have their hands raised, how much of your television has shifted? In other words, how much of your television viewing is no longer live? Raise your hand if the majority of your television viewing is no longer live. [About half of all the previous hands.] All right, that’s intresting. 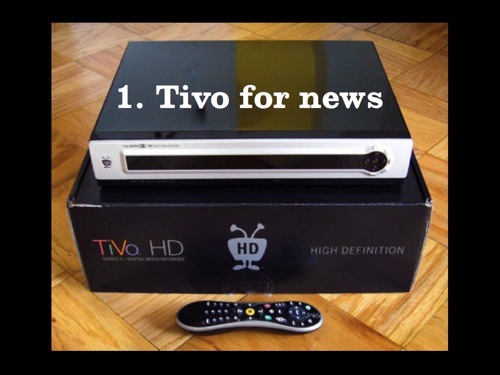 There is a wave of technologies that are trying to take the Tivo lesson and apply it to other areas. If you look at, for online video, Boxee Box does this. For text, Instapaper is the way that I like to timeshift news, timeshift journalism, timeshift content. I’m just curious, does anyone here use Instapaper? [Most of the audience.] You are my kind of people. So for those of you who may be unfamiliar to it, the idea of Instapaper and other tools like it is that when you encounter news or text, it’s not always — the time in which you encounter it is not always the same time you want to consume it. The time of the hunt is different from when you go and dress the animal and consume it at dinner that night. And with the multiplicity of screens that we deal with now — whether that’s smartphones, whether that’s tablet, home computer, work computer, whatever it may be — there is now an opportunity to take things that appear in one context and shift them to another, just as with Tivo. And we’re starting to see some data that illustrates that this is a powerful thing, that should be impacting the way news organizations think about the work that they do. 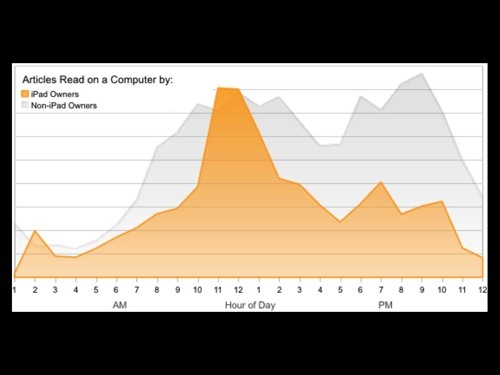 This is data from Read It Later, which is a competitor to Instapaper, another company that provides a tool that enables you to notice something, mark it to be read later, and then in another context, read it in a different environment. Well, you see the top of this chart — that’s a 24-hour day, so midnight is on the left, noon is in the middle, and the next day’s midnight is on the right. 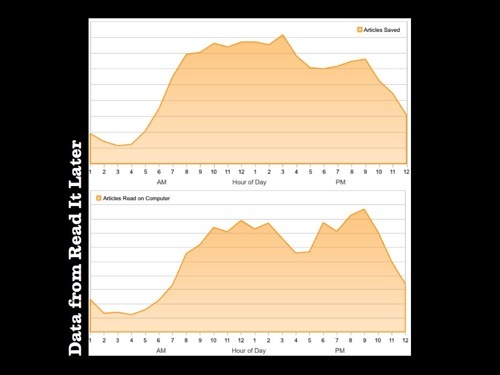 The top graph is when pepole save articles on Read It Later, on their servers. And you can see it pretty much matches the workday — it matches the time when you expect people to be in front of a computer. There’s a slight peak in the afternoon, but pretty much from 9 to 5, it’s pretty consistent. The data on the bottom is when those articles get read on a computer. In other words, Read It Later is able to see when you said “I want to read this later,” but also when you go back and actually read it. And you see a shift that you might imagine: A lot of people are taking things during the day and marking them to be read, but then in the evening when they are at home, they are actually doing the reading — probably in a different sort of environment than they would be when they are sitting at their computer. The academic researcher Pablo Boczkowski has done a lot of research about the ways in which online media has historically shifted news consumption from the breakfast table, or the evening when you’re watching television news and eating dinner, to when you’re at your work computer and you’re checking out CNN.com at 10:00 when you don’t really want to work on that report. So you see a small shift here. But the shift is even more remarkable when you look at other devices. On the top we have the reading patterns of users on the iPhone. There you start to see people just waking up at 6 in the morning and doing some reading while they’re in bed. (Which may or may not be a healthy environment; you’re getting that screen too close to your eyes.) Another peak, in the early morning, probably when people are just getting to work. A lull during the day, and then commute-back time when you’re on the train back home, and then later on at night. And then look at the iPad, the bottom chart. A massive shift to the evening. The iPad, and other tablets by proxy, are really all about consuming on couches and in bed. It is truly an evening, relaxation computing environment. What’s really remarkable is that not only are we seeing the consumption shifting, the availability of that period of consumption in these tools is also shifting the way people are marking articles in the first place. 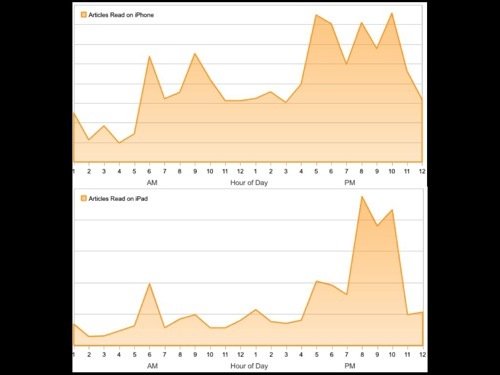 This chart, the yellow in front illustrates when iPad owners are marking their content. This is when they’re saying, “I want to read this later.” They’re basically channelling that into the lunch hour, whereas the gray in the background is the chart I showed you before about all users, when they’re marking it. Basically, we’re already seeing that these new devices are changing the way that we consume news and other information. They’re changing the times that we do it, and that also changes the kinds of things that you’re interested in consuming. The kinds of things you want to read at 10 o’clock at night are not the same things that you want to read at 9 in the morning. It’s going to be up to news organizations and other online entities to try and figure out how can we better produce the kind of content that will fit into these sorts of niches. The second trend I want to talk about is more sharing of content. And I say “in both directions.” I wanted to include a little CanCon in here, so the obligatory picture of David Frum. But what’s interesting about this — Talking Points Memo, a very noted and accomplished politics site in the United States — notice that this is a story that appears on Talking Points Memo’s site but was not written by Talking Points Memo. It was written by someone at Mediaite, a different website based in New York that covers the media. There’s sometimes an overlap between the things that Mediaite is interested in and the things that TPM is interested in. 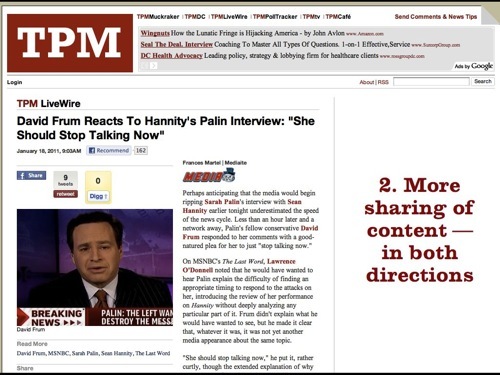 And they have a deal where TPM publishes Mediaite stories on their site, and vice versa. They have similar deals with a number of outlets. If you go read the tech blog Gizmodo, you will find stories that originally appeared on Wired, or that originally appeared on CNet. There’s this real strong cross-pollination that actually flies in the face of a lot of people’s assumptions about online content. A lot of traditional news organizations really view their content as something that shouldn’t be shared with other news organizations. They’re very defensive of anyone who would try to think about doing something like that. But you see a lot of new online news organizations thinking instead of content as a marketing opportunity. There are probably lots of people who read Talking Points Memo who’ve never heard of Mediaite. There are lots of people who read Mediaite who’ve never heard of Talking Points Memo. And every time that they cross-pollinate on content — which cost neither organization any money; there’s generally no money exchanged in these sorts of deals — it’s really an opportunity for people to learn more about what’s available to them. It’s a real shift from the kind of world where a major metropolitan area would have one or two newspapers, a few TV stations, maybe a news radio station — where you have the platform so narrowed down that people don’t have a lot of choice and discovery is not as key of an issue. You don’t need to independently discover all three TV stations in your network if it’s 1985. You’re going to find out about them pretty quickly enough. 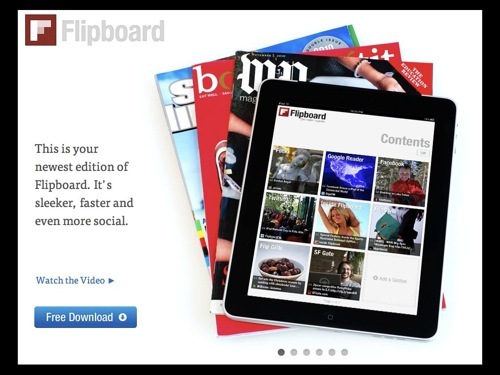 Flipboard however makes it visual, makes it very attractive. They take the content from various feeds, put them in magazine format that’s very attractive. It was just declared the iPad app of the year by Apple, and really has achieved huge success. In just a couple of months of being out, it had already been installed in over a million iPads. And the model there is, let’s be a conduit to other people’s information. Let’s do it in a beautiful way. Let’s do it in a way that encourages a laid-back reading experience. And I think that we’re going to see a lot of more traditional news organizations realize that this is a model worth pursuing. News organizations who have a lot invested in producing their own content have traditionally not been too excited about promoting other people’s content, about being an aggregator, being a curator. A lot of their efforts in these areas have been kind of halting — their heart hasn’t been in it. Whereas I think a lot of news organizations this year are going to start seeing that if they want to be the one source of news for their customers, or the primary source of news for their customers, they’re going to need to present more of the world and more of the online world, and that aggregation of pulling things together will be something they will buy into more. 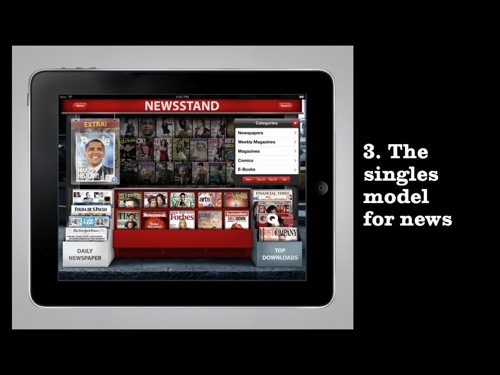 Number three, the singles model for news. So one thing about articles and news pieces is they always needed a home. If you’re a reporter and you go out and you report a story, and then you are just able to tell it to your boyfriend, that doesn’t go very far. You need to produce news and then share it through a conduit, through some sort of entity that has an audience. In the old days, this was a very simple endeavor, because there are only so many entities and you knew how to reach them. But in the new environment, the production of journalism and the reaching of that journalism to an audience can be very segregated things. And just as, for a long time, articles need their own home in a news organization — you think back to music. If you go back to 1989, unless you were one of the seven people in the world buying cassingles, individual songs needed to be on an album to reach their audience, for the most part. That was the way in which an individual song would reach it’s audience. But along comes iTunes, and all of a sudden the atomic unit of music shifts from being an album to being a song. And that individual 99-cent purchase on iTunes becomes a way to get the music that you want without having the larger superstructure around it. This is as much hope and guess as it is a prediction, but I think this year we’re going to see some interesting progress towards that evolving for the news world. We’re going to see what happens in a couple of weeks — Apple is expected to announce a new way of selling subscriptions and dealing with news content within iTunes for the iPad, tied to Rupert Murdoch’s project The Daily, the iPad app. And I think we’re going to see some sort of front-end evolve that will use the purchasing system that is in iTunes, that will work on iPhones, work on iPads, work on your computer, for buying good magazine-length stories for 99 cents — that will enable reporters or journalists who have their own audience, many of whom have their own social media presence, have their own people who care about them as individuals as opposed to members of a larger organization. I think we’re going to see some progress that’s going to allow that middleman of the news organization to be cut out. Not in the majority of cases — not anywhere close to the majority of cases. But I think in 2011, we’re going to see some interesting movement there: a way for an individual writer to kind of go around getting the approval of a glossy magazine editor or getting a newspaper editor’s approval to get something to an audience. 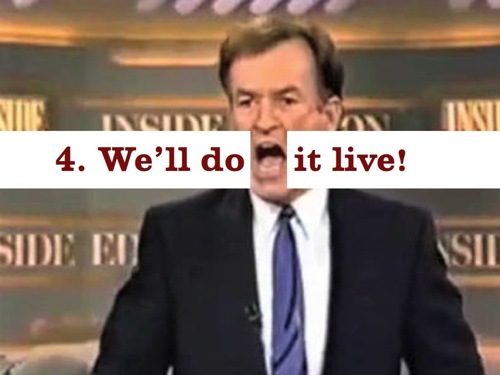 Number four, “We’ll do it live.” I’m never quite sure how much the Internet memes involving Bill O’Reilly cross national borders or not. But, anyway, ask your friend. Does anybody here remember where they were 20 years ago today? Anyone have any thoughts? Because 20 years ago today, I can tell you where most Americans were, at least, or a lot of Americans. They were watching CNN because it was the day after the Gulf War had started. 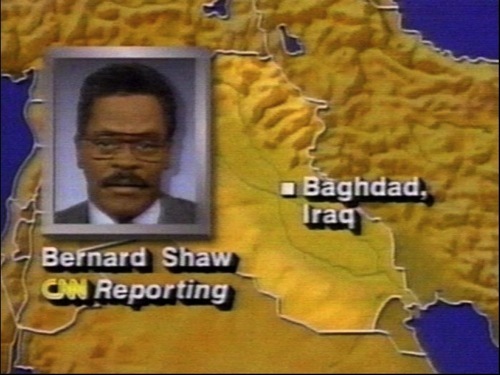 And we had Bernard Shaw and the other team members there — John Holliman, I think — in Baghdad on the audio line. There’s an interesting movie made about this and the way in which they negotiated with the Iraqi government to get this one kind of line that would survive the initial bombings, so that they would be able to still be able to report from their hotel room in the middle of Baghdad. This moment was described by a lot of people as a real pivotal moment in the perception of cable news, as a moment when the liveness and the moment-by-moment nature of having a channel devoted to 24 hours of news really reached the audience and engaged with it for the first time. You know, we had something a week and a half or so ago that had similar evocations, for me at least, which was the shooting in Tucson, which was really the first time that you had a national tragedy — the kind of thing that people would want to be in a communal environment for — that happened at a time when a significant number of Americans are on Twitter and able to see the flow of their friends’ and other people’s commentary as the day moved on. I was one of those people, who being of both worlds, I had CNN and MSNBC on and flipping back and forth, but I was also reading Twitter. And it was tremendously interesting to see the ways in which the stories being told diverged. CNN and MSNBC, at least in the initial hours after the shooting, were being very responsible, very straight-arrow — doing the things that you would expect them to do, that are probably the right things for them to do in that environment, which is just trying to get as many facts as they can, trying to reach as many law enforcement officials, and trying to manage the experience of a live breaking-news event. Whereas on Twitter, it had already moved on to trying to process the anger that people were feeling about this happening. Trying to, you know, drum up the links — since Google is the greatest tool of a seat-bound journalist — trying to drum up the links that would try to explain these things, some of which proved to be not quite as accurate as you might have hoped, such as the Sarah Palin map, among other things. This dual conversation really nailed home to me the idea that this upcoming year I think we’re going to see a real evolution in how we experience live events online. I can’t say exactly what that’s going to be. We’ve seen a few experiments. CNN did some interesting stuff around the Obama inauguration, trying to pull in people’s information from Facebook alongside live commentary of the traditional video variety. But I think that there’s going to be some really smart person who comes up with the merger of social media and real-time reporting and all the other elements to create something that has the real-time energy of broadcast. I’m really interested to see what that’s going to end up looking like. 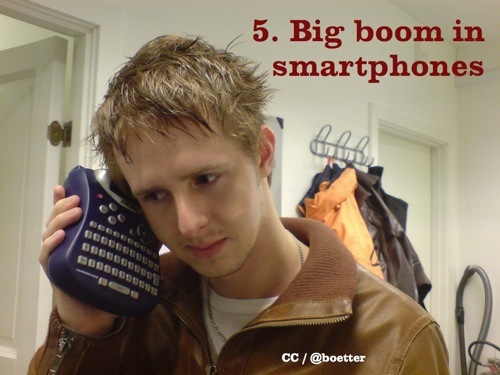 Number five: You’re going to have a big boom in smartphones. (Hopefully not that one.) It’s very easy when you live in a certain kind of world — and many journalists live in this kind of world and think everybody has a smartphone. Everybody’s got an iPhone or a Blackberry or an Android — since most of your colleagues in newsrooms, for example, or many of your colleagues on university campuses probably have them. But smartphones are still a relatively rare thing. I don’t know the numbers for Canada, but it’s somewhere around 20 percent of cellphone users in the United States have smartphones. And there’s going to be a huge pickup, greater than any previous year I think, this year, where people are going to have iPhones and Blackberries and Androids and have a mobile web experience that they haven’t had before. How are people going to react to that? One of the big debates going on in the news world is how much to invest in a good mobile website versus how much to invest in building apps. And if you invest in apps, how much do you invest in your iPhone app versus your Android app versus your Blackberry app versus your Windows Phone 7 app versus your Symbian app versus — et cetera. At the Lab, we gathered some evidence on election night in November which I thought was kind of interesting that in fact argues against the app strategy a bit. Just a bit — it’s just one data point. 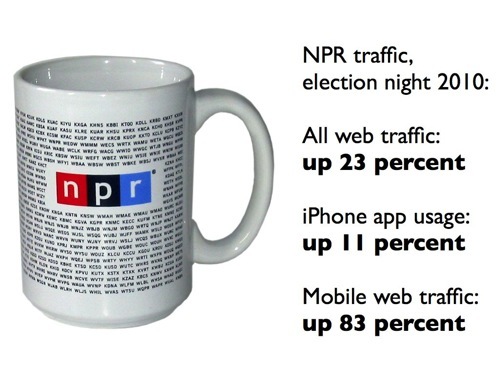 On election night, NPR — National Public Radio, although they don’t call themselves National Public Radio any more because radio is so passé — anyway, all their web traffic on NPR.org, their website, they were up about 23 percent that night versus a typical night. They have a very nice iPhone app. The usage of that iPhone app was up about 11 percent. But the usage of their mobile website was up 83 percent. That indicates to me that, at least in a breaking-news environment, when there’s information that you want right now, people are still turning to the web — even if have access to apps, because many of those people were using iPhones and using Android, all of which have apps available on them. So I think this evolution of smartphones is going to raise a whole lot of questions about the influence of location on news. There are many people that think that people will want to be able to get news that is tied to the area immediately around them, based on the GPS in their phones. I’m not as sold on that as many news executives seem to be. But I do think that the evolution of the smartphone market’s going to have really big impacts on how news gets consumed, along the lines we were talking about earlier with thos charts about how people read. 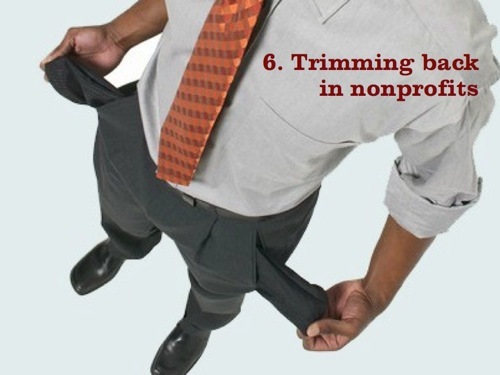 Number six: I think we’re going to see a trimming back in nonprofit news outlets. I will confess I’m speaking here from the American context and don’t know enough about the Canadian context to know how much it applies here. But over the last few years in the United States, we have seen this massive explosion — this wonderful, massive explosion in nonprofit news organizations. You have the traditional news organizations — the Center for Public Integrity, the Center for Investigative Reporting, that have been around for 10, 20, 30 years, who have established themselves. But there seems to be a nonprofit news organizations popping up every 100 miles or so across the United States: in most major cities, a lot of statewide investigative nonprofits, as well as the national ones that get a lot of attention like ProPublica. But I do think that 2011 is going to see some trimming back, because a lot of these news organizations were started on initial gifts from very well intentioned wealthy people, or local foundations that gave lump-sum payments. And a lot of them are having a real difficult time transitioning to anything that looks sustainable. They’re having trouble building up enough a readership base so they can expect a public radio model of seeking donations — or American public radio model of seeking donations from their users. And there are only a few foundations on the national level that everyone is asking for money. The Knight Foundation probably gets — I know, for a fact, gets many thousands of requests from people who want them to help out their nonprofit news effort. And they only have so much money. Another element is that a lot of these nonprofits were started by journalists. I love journalists. I am a journalist! But journalists aren’t always the right people to run businesses. So I think there will be plenty of successes, and ProPublica and some regional ones — like the Texas Tribune, MinnPost, Voice of San Diego — are still going to be successful. But I think we will see a thinning out that will be difficult, because it will counterbalance the optimism that these organizations brought with them. Number 7: New front pages. When I say front pages, I don’t just mean the front page of a newspaper, or even the front page of a website. I really mean the entry point for an audience seeking news. The front page of a newspaper — or, you could also argue, the first few minutes of a newscast — are tremendously powerful tools to focus the attention of an audience. They provided a really nice structure for guiding the audience. It’s not a situation where, if you turn on the 5:30 news, you get to choose which of the 17 stories you want to listen to — you’re going to listen to whatever they decide is the first one on their list. Then you’re going to listen to the second one. And front pages of newspapers have always been a very nice way to narrow down the enormous universe of information that’s in a paper like The New York Times or The Globe and Mail to just a few things — to just, here are the six stories that matter the most. The New York Times this week, an editor there who is in charge of their digital effort said that, still, 50 to 60 percent of traffic to The New York Times website comes from people typing nytimes.com into their browser or going to a bookmark. As much as we talk about the power of social media and Facebook and Twitter and emailing around of links and search, it’s still an enormously powerful engine of traffic. I would say actually that for most American newspapers, it’s probably higher. It’s probably 70 percent in a lot of cases. But unfortunately, front pages are generally not the most attractive things in the world. I don’t just mean that from an aesthetic point of view — they’re also not particularly usable in a lot of cases. Think of a newspaper front page that’s just this splattershot of 50, 60, 100 different links to stories. Not always focused, not always guiding you, and not always following through on the implicit promise of a good front page, which is that if you give us your attention, we’ll tell you what’s important. They’re also one-size-fits-all. With very few exceptions, if you go to one newspaper’s front page, it’s going to be the same front page that other people — with very different sets of interests — are going to be seeing. And the result of that is that a lot of people go to websites, and then run away scared or frustrated. 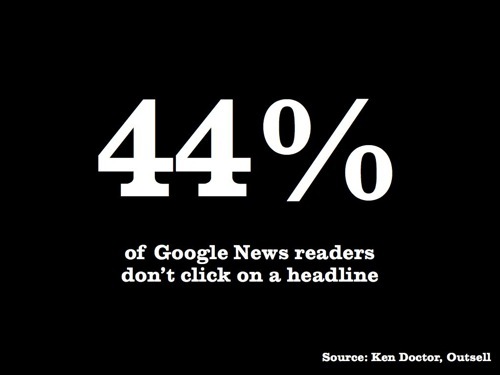 This is data from Google News, but 44 percent of Google News readers never click on a single headline. They go, they scan, and then they go someplace else. And I know anecdotally that a lot of news organizations’ websites fall into a similar pattern. So I think we’re going to see a lot of attempts at evolving the front page. 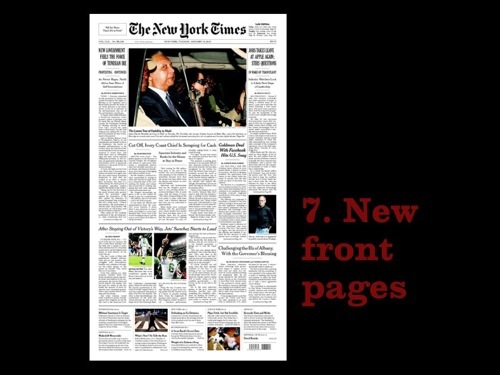 Now that doesn’t just mean evolving in the traditional news-organization front page sense. 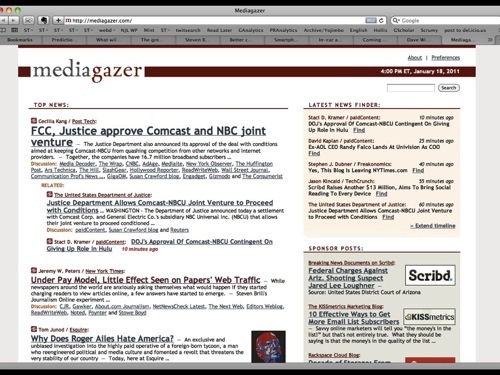 You’ll see things like Mediagazer, which is a terrific site if you’re interested in media news, but the vast majority of it is run by an algorithm, that, not unlike Google News, focuses through all the elements, all the feeds and all the sources of news about the media that they think are important — that they’ve told the algorithm is important — and then spits it out. But they also have a layer of an editor, who then sorts through all that and is able to overrule the algorithm when necessary — when it pumps up a story that doesn’t quite deserve it, or to promote a story that isn’t getting a lot of attention from the algorithm’s perspective, but the editor thinks that it should. So I think algorithms will play a role. I also think that new presentation forms play a role. 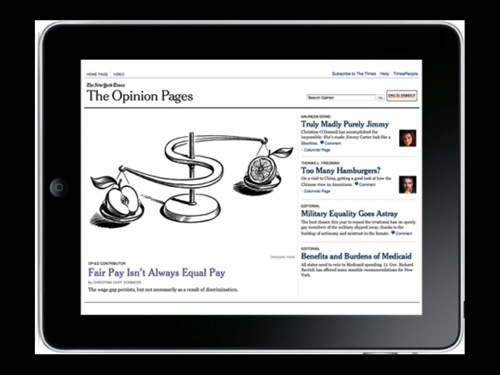 This is the redesign that launched a couple of months ago of the opinion pages in The New York Times. This is just what it looked like when I took the screenshot — it actually changes up quite a bit. But one thing is pretty consistent about is it that it really looks like an iPad app. So this is actually a website, just I’ve embedded it inside the iPad frame, but — large touchable areas, interactions between the various parts of the page. It feels like an app experience. You see that in a number of other places. Twitter, the new version of Twitter that was unveiled a couple of months ago has, instead of thinking in terms of individual pages, there’s a flow between the left column and right column that also has more of an app-like feel. And the Gawker Media blogs, which are a place that a lot of people look to for the evolution of design of new media, is going to be debuting later this month this new design, which is also similar to the Twitter design — a column of information from which the selection flows back and forth to give you more of an app-like experience. One of the reasons why people are trying to evoke an app-like experience is that app-like experiences do a better job of making people read more stuff. According to the BBC, or an editor I talked to there, for people who go to the BBC News website, they on average read 2.5 stories. That’s what a typical visit is: read two or three stories, then go someplace else. 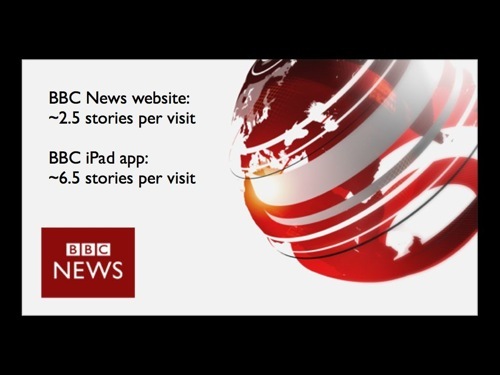 Whereas for people who use the BBC iPad app, it’s about six and a half stories. There are similar numbers for National Public Radio, for The New York Times, and others. And this sort of deeper engagement is something news organizations really need to harness. Because the default position is that you’re one of a trillion websites, and your ownership of anyone’s attention is very limited. So the more you can engage people to think, “This is a place I want to dive into and experience more,” the better. Another element of this is — I don’t want to shortsell the role of social media. I think one other change you’re going to see this year is you’ll start to see news organizations have more traffic from social media sources like Twitter and Facebook than from search referrals, than from people searching on Google. I can say from the Lab’s website, that doesn’t quite have the traffic of The New York times, it has grown substantially so that now Twitter generates significantly more traffic than Google does for us. Somewhere around 30 to 35 percent of our traffic comes from Twitter, which is a level far beyond any traditional news organization, which would probably be in the area of one, to three, to five percent maybe. Whether our users are just brilliant and on the cutting edge or not, I’ll let you decide. One last element about this. 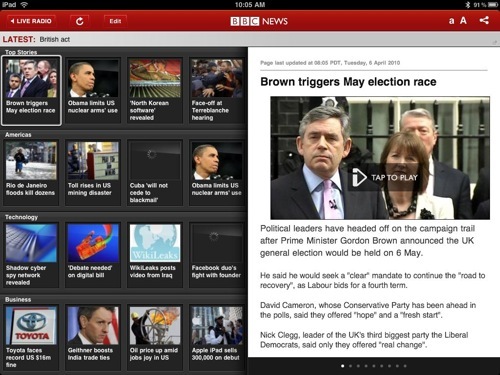 This is the BBC’s iPad app, if you haven’t seen it. And I think one of the brilliant elements of it is that when you launch the app, it doesn’t present you with a menu of options. It doesn’t say, “Here are 17 options, choose one.” It’s not a choose-your-own-adventure. It immediately tells you, “This is where your adventure should start.” It puts you in a story right away. You don’t to have any action, you’re immediately pushed in. And then it becomes, “How do you navigate from story to story?” Instead of going to a story, hitting the back button, going to look over the other menu of options, then going back again. The metaphor that exists on a lot of iPad apps in the news world is swiping from story to story. Which is a very similar experience to what you traditionally had in newspapers — seeing stories and being able to dive in right there. And finally, the eighth trend that I’ll talk about before we can continue the conversation in Q&A, I think we’re going to see a significant shift in Google results this year. No one has come close to really being a true competitor to Google in the search field. It’s still incredibly dominant. Looking at our traffic statistics, 98.5 percent of our search-engine traffic comes from Google. Bing and others have higher usage numbers but they don’t get used nearly as much by each user, even the user numbers are okay. This is as much anecdote as anything else and personal experience, but there seems to be a growing level of frustration with the quality of Google search results. Just try and find information about a hotel. You will find, if you search for a hotel, you will find page after page after page of junk review sites and nonsense, every one of which has done a very good job of gaming the system through the dark arts of SEO, or search engine optimization. 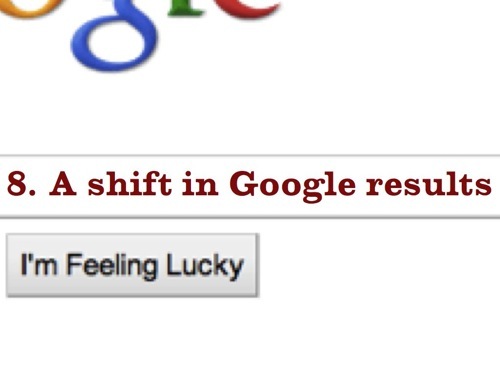 There are many other fields for which Google has really just become really difficult to use. Or at the very least, very frustrating to use. And there are entire companies in the news business — or at least the “news business,” I might put scare quotes around that — that are designed around SEO, Demand Media being the most prominent of them. If you’ve ever searched on Google for anything that starts with the words “how to,” there’s a very good chance the top result you were offered was owned by a company called Demand Media, which I believe — I’m remembering these numbers so they’re probably wrong, but runs something like the 12th-largest network of websites in the world — none of which you would know. I think ehow.com is the only one you might have some recognition of. And these are all designed to offer very cheap content to answer the kinds of questions people are going to search for. It is designed entirely for search. I think that, while Google does a lot of things and has its hands in many different cookie jars, search is where it gets the overwhelming majority of its revenue. Everything else loses money. [Slight exaggeration!] Search, however, is a printing press at a mint. It generates billions and billions of dollars. They care a lot about the quality of their search results, because they want to short sell any opportunity anyone else would have to gain loyalty as a search provider. So I think this year, we’re going to see a noticeable shift in Google’s internal, inscrutable algorithms to improve those results and to get rid of some of that SEO gunk and make searches more reliable. I think this could end up favouring news organizations. Google, for a variety of reasons, mostly political, has been trying to reach out to news organizations and try to prove that they’re the good guys. Mainly because they don’t want to get sued by news organizations, who have not always been very friendly to Google. They’ve been doing small things to try and curry favour. And I would not at all be surprised if, when they do these sorts of tweaks, that news organization results end up getting a little bit of a bump. So there you have it. Those are my eight predictions for the year. And, just as a closing thought, I sort of feel similarly to what Nora was saying earlier. I feel better about the state of journalism now than I have in quite some time. That doesn’t necessarily mean that newspapers are suddenly going to begin hundreds of reporters back. That’s probably not going to happen. It doesn’t mean that the old system of scarcity is going to return, because it’s not. But you do have traditional news organizations placing bigger bets on online, trying to create revenue models that can work. You do see the opportunities that tablets and smartphones are going to provide. You have startups that are finally achieving a degree of scale — things like Politico which now has a newsroom in the many dozens of people. You have big online outlets that are trying to gain prestige by hiring name-brand journalists, whether it’s AOL News or Yahoo News or the Huffington Post. And you have nonprofits that doing a lot of the work that would otherwise fall between the cracks in this very multifaceted system. So when all is said and done, the new world is not going to look anything like the old world. And there will still be things that we used to get from the journalism industry that we’re not going to get anymore. But in the end, I think it’s going to be counterbalanced by all the enormous wealth of new information, including a lot of really great journalism, that’s going to be produced by this new ecosystem. And in the end, I think it’s going to end up doing a better job of serving the information needs of readers and viewers and listeners. So, thank you very much. POSTED Feb. 14, 2011, 11 a.m.
Benton, Joshua. 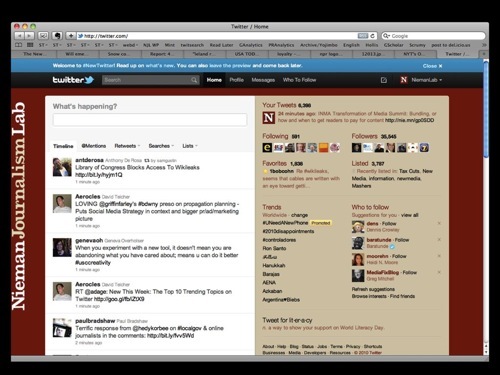 "Eight trends for journalism in 2011: A Nieman Lab talk in Toronto." Nieman Journalism Lab. Nieman Foundation for Journalism at Harvard, 14 Feb. 2011. Web. 25 Apr. 2019. Benton, Joshua. 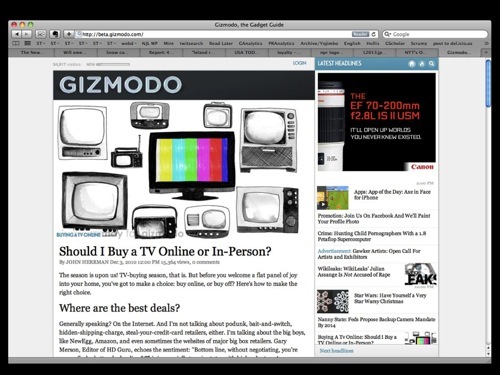 "Eight trends for journalism in 2011: A Nieman Lab talk in Toronto." Nieman Journalism Lab. Last modified February 14, 2011. Accessed April 25, 2019. https://www.niemanlab.org/2011/02/eight-trends-for-journalism-in-2011-a-nieman-lab-talk-in-toronto/.